Our motto here at Whiteline is “Activate More Grip” and our philosophy is to achieve the maximum amount of usable grip on offer. There are many ways to increase the overall grip available on your car however here we will be mainly looking at how to avoid a classic mistake with MacPherson strut suspension and low ride height that can often result in loss of grip. Many cars in the tuning world run coilover suspension, for example the Whiteline Max-G coilovers, for the benefits they give such as adjustable ride height and damping, and whilst it's very satisfying buying tuning parts such as anti-roll bars or anti-lift kits, sometimes the best result can come from a simple setup change. General wisdom suggests that once you've fitted your coilovers you'll be setting the ride height at a low level to reduce the centre of gravity. Reducing the centre of gravity will theoretically increase the maximum cornering speed of the vehicle, however this is not always the case. And in the case of lowering springs most performance lowering spring kits that are well developed, will take into account a number of factors, one of which being the roll centre location, another of course being ideal spring rate. So What Is Important About Roll Centre And Ride Height Then? The roll centre is a virtual point at which the chassis interacts with the centre of gravity to create weight transfer and roll. 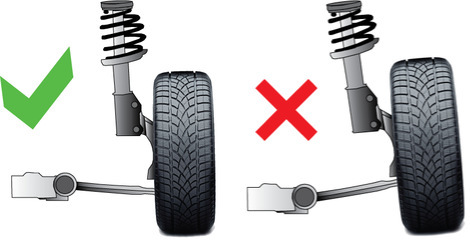 This is particularly important with regard to MacPherson strut suspension. The reason for this is MacPherson strut suspension doesn't have an upper arm, the geometrical equivalent of the upper arm is the top mount. What this means is the typical roll centre location of a well-designed MacPherson strut suspension is just above ground level. The majority of chassis engineers will seek a roll centre fairly low to ground level, but slightly above it. "The Problem Occurs When You Lower The MacPherson Strut Suspension Too Far." With a double A-Arm or double wishbone suspension, where unequal length arms are used, a chassis designer is able to engineer favourable geometry and camber change throughout the functional range of the suspension travel. Unfortunately, on the MacPherson strut suspension the engineer doesn't have this luxury and the camber change and roll centre change on a MacPherson strut at very high lateral loads can often result in the loss of grip. So what does this have to do with the ride height? Well a picture speaks 1000 words, so please consult the image below to see at a glance what we're dealing with. "Eventually The Car Will “Fall Over” Onto The Outside Front Wheel." As you lower your coilover equipped car, with MacPherson suspension the lower control arm will eventually start to point upwards at the outboard end, referencing ground level. What this does in reality is drop the roll centre below ground. The impact this has dynamically though, is far greater than a static drawing would show. With the roll centre below ground height more weight is transferred via the springs (likewise raising the roll centre reduces weight transfer through the springs and increases weight transfer through sprung mass). This makes body roll more pronounced and in turn increases the leverage against the lower roll centre, making the instantaneous centre move well outside the vehicle causing even more weight transfer and roll. Eventually the car will “fall over” onto the outside front wheel. The tires limits of grip will now have been breached, no more weight transfer can occur. To the driver this is a very frustrating feeling, quite often on a front wheel drive car the rear inside wheel will now be airborne, and the car just understeers relentlessly. a) Keep the lowering to an optimal level to ensure the ball joint pivot point is not above the centreline from the inboard mounting point. b) If you are lucky enough to drive a Subaru Impreza, BRZ, Toyota 86 or Mitsubishi Evo – then you can you buy the appropriate Whiteline Roll Centre Adjustment product. c) If you are building a race car you can move the inboard mounting points upwards or fabricate a ball joint extender. In summary, if you want extremely lowered MacPherson strut cars, then you must attend to the subsequent geometry problems or risk driving a car with so much understeer it will only be a matter of time before it meets a hedge.